This is part 2 of an ongoing community project to help people understand how to get jobs during a recession. This data is slightly skewed towards those that are already active in social media as the survey went to those within my network on my blog and the highly connected Twitter community. There were 214 respondents to the survey although this graphic only represents those who got jobs since Sept 2008 (71 respondents) that represent those that were hired during the announcement of the recession. This sample set is smaller than one would expect out of a formal research project, after multiple promotions, it was capping out at 200 respondents, and I don’t have other resources to deploy against email lists, or affiliate programs. This is a personal research project, and is not tied to my employer, clients, or anyone else for that matter. This is just the data from the 71 respondents that got hired since Sept 2008 (since the recession started). 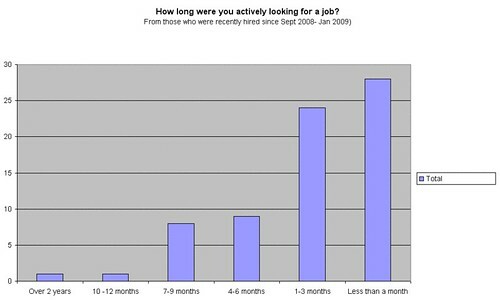 This means that 72% of respondents were able to get a job within 3 months of actively starting to look. To find the other results from this survey, I’ll be tagging the post “Job Survey” and you can click that category to learn more. I forgot to thank some folks with their ideas for questions for the survey such as Peter Kim, Bryan Person, Chris Kenton, and Charlene Li. Coming soon I’ll be posting results for: top industries hired, compensation rates, and some other interesting data cuts.